Spotlight on........Ayia Triada Beach Ceremony Venue. 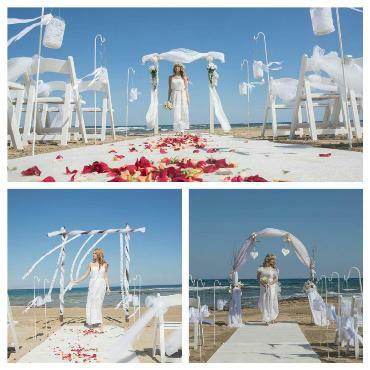 Ayia Triada beach, also known as Ayias Trias beach (meaning the Holy Trinity, in Greek), is a fairly new ceremony venue, held on the beautifully idyllic and remote beach, based in Paralimni, next to an old fishing harbour. With its golden sand and clear water, the venue is easily accessible and has ample space for parking. With the picturesque Ayia Triada chapel situated close by which forms a perfect backdrop for your wedding photos. This beautiful ceremony venue is becoming more popular and will soon be one of the islands most sought after beach/seafront venues. It is one of the only ceremony venues where the municipality offer a choice of decoration, depending on your theme. There is a choice of boho chic arch, the Grecian arch or the classic arch (see attached photos of each).